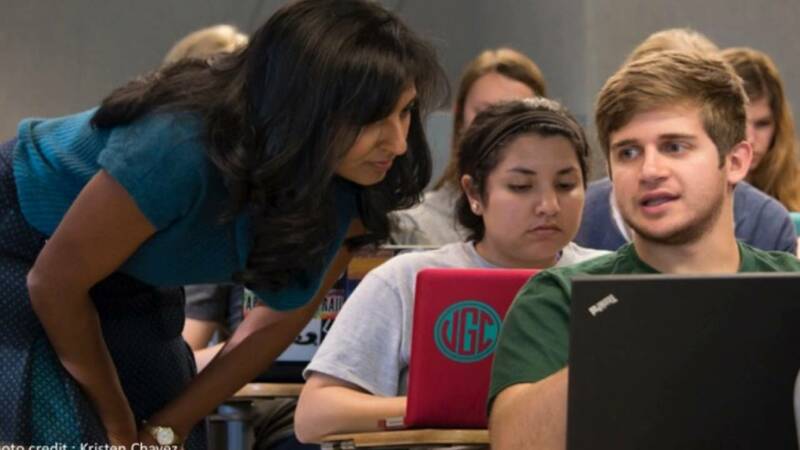 Carolina faculty members have a long tradition of innovation in the classroom. Their willingness to experiment with promising new instructional techniques and models has benefited students and peers on this campus and beyond. The impact of their work is especially broad when they are able to realize opportunities to share their findings through peer-reviewed publications, conference presentations, and other dissemination channels. The growing number of faculty members interested in sharing the results of their work in the classroom represent the movement known as the scholarship of teaching and learning (SoTL). This work is based on methodologies that offer some evidence about the impact of the intervention on student learning experiences and outcomes. Recent examples of the University’s contributions to this area of scholarship include Kelly Hogan’s (Biology) study on active learning and closing achievement gaps or Julee Waldrop’s (Nursing) contributions to a new book on flipping the college classroom. Study findings must be based on a UNC-Chapel Hill credit-bearing course(s) or curricular enhancement. A broad range of instructional settings are eligible; for example the work could focus on enhancements to a residential course, a fully online course, a course offered through a Study Abroad program, or a service learning course. Applicants should have collected a majority of their data, evidence, field-notes, or other observations from their course(s) by the time they apply. The program awards two different types of grants: publication grants to support faculty during the analysis and write-up of their SoTL project findings and presentation grants to defray costs associated with conference preparation and travel. Faculty members who receive a Publication Grant are still eligible to apply for a Presentation Grant, and vice versa. A faculty member who has received a Presentation Grant will not be eligible to apply for a second Presentation Grant on the same study. Multiple faculty members presenting on the same project at the same conference are eligible, assuming roles are clearly defined. Each should complete a separate Presentation Grant application. The number of grants awarded each year will be based on the quality of proposals and limitations on the overall project budget; applicants who are not funded may be asked to resubmit their proposals during the next grant cycle. The application process for this grant involves multiple opportunities for interested faculty members to get feedback on their proposals. By identifying proposals that are NOT a good match with the goals of the program as early as possible, we hope to minimize wasted time for all parties involved. 1. All interested faculty members should begin by submitting a brief statement of interest through our online form. 2. Faculty members whose statement of interest lines up well with the program goals will meet with CFE staff members to discuss the proposal planning process. 3. Full applications are due on one of two annual dates: March 15 and September 15. The purpose of these grants is to subsidize costs associated with presenting SoTL study findings at a local, regional, national, or international conference. For example, funds may be used for conference registration, travel, poster preparation. Funds may NOT be used for conference support for non-faculty members in any way. Awards for presentation grants are capped at $1500. Allowable costs should be consistent with the applicant’s departent’s travel policies. Applicants will be asked to provide a proposed budget in the full application. Proposals for presentation grants will be handled on a rolling, as-needed basis. Faculty members are welcome to apply for one of these grants only after a conference paper or presentation has been accepted. 1. To apply, download a copy of the full application and follow the instructions. Please contact us with any questions at cfe@unc.edu.